Burp Rag Pattern....an updated tutorial (now with printable pattern!) - Stop staring and start sewing! This tutorial has been getting a lot more attention due to Pinterest (follow my Pinterest boards here) so I thought this would be a good time to update it. Back then I didn't have the skills to create a printable pattern/pdf file and now I've got some crazy skillz so we're good to go. When you print it out (you'll need to print 4) you need to chose US LETTER (BORDERLESS) for your paper size option. If you don't chose borderless then it won't print the upper and lower edges. Cut out the shapes and tape them together without over-lapping. Mine has heavy duty interfacing fused to the back and a hole punched through it so I can hang it up. Here's an example of a gift for a boy that I made. One side is quilting cotton and the other is flannel. Here's a girl's version with both sides being flannel. I usually serge my edges (it only takes minutes to make 4 of them that way!). But if you don't want serged edges you can add 1/4" seam allowance all the way around and sew them right sides together. Just leave a hole about 3" long for turning them right side out and slip stitch the hole shut. Another option is to embroider a monogram at one end. It will look beautiful and nobody will know you spent just a few dollars on your baby gift. Just cut a rectangle big enough for the pattern plus about 3 inches at one end. Trace your pattern, transfer the letters for the monogram, put the fabric in and embroidery hoop and stitch away. 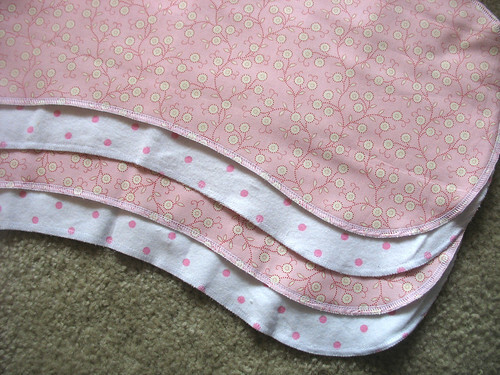 Be sure to add 1/4" seam allowance around your traced pattern when you cut the burp rag out. This pattern has served me well over the years (for my own babies and those of my friends) and I'll be using it for years to come. I've never had a disappointed recipient. So take it, use it, enjoy it!! Let me know if you have any questions!